A brisk ride on the C train dropped me right at the doorstep of Classic Culinary Arts '02 grad Tyler Kord’s No. 7 in Fort Greene, Brooklyn. I was greeted just before opening by a buzzing staff of waiters and cooks who were hurriedly wolfing down a family meal of franks and beans before running about to help ready the elongated, gleaming space that conjures glimpses of old New York in its marble tile, vintage bar, and oversized distressed mirrors. Looking around at all of the warm touches that have gone into the restaurant, it’s hard to imagine this location being used as a doctor’s office, as it once was. Tyler poked out from behind the exposed kitchen area just long enough to shake my hand before ducking back in to shout out the night’s specials, which included lentil soup and red snapper with scallops and shrimp. Even with solid backers and friends helping with the renovation of the space, there was still a rush to open quickly (and initially sans liquor license) to start cash flowing into the operation. Tyler loves his job and thankfully lives a few blocks away from his restaurant, which enables him to come in around 10am and he often will stay on until after 2am the following morning. “Why sit at home on the couch when I could be here making my restaurant even better?” He then added that on Mondays, his lone day off, he does indeed like to sit on the couch while watching Bond flicks. Tyler’s lively personality is reflected in striking, colorful dishes that have been called a fusion of Hungarian and Korean fare, something Tyler didn’t intend at first but has come to embrace and expand upon. The roast chicken with peach gelée, truffled corn, and sugar snap peas I ordered a few nights after my meeting with him was beautifully plated with medallions of tender meat resting comfortably around crunchy fresh veggies. 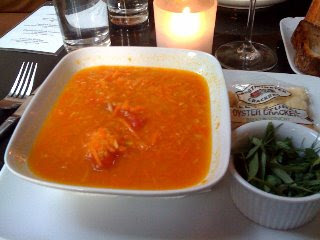 And the carrot ginger soup of the day (pictured) couldn’t have been prettier. A friend who joined me ordered the fried broccoli, dill, grapefruit, and black beans appetizer—admittedly an odd-sounding combo—but it came together beautifully. Several of Tyler’s employees have been brought over from Perry Street, including his pastry chef, Amanda Clarke, who has also worked at Jean Georges. Don’t even think about leaving No. 7 without ordering her chocolate pudding with root beer chantilly, cocoa streusel, and peanut brittle crisps. No. 7 is open for dinner from Tuesday through Sunday from 6PM – 2AM; Visa and MasterCard are accepted; Reservations: 718-522-6370; Visit their website for directions.